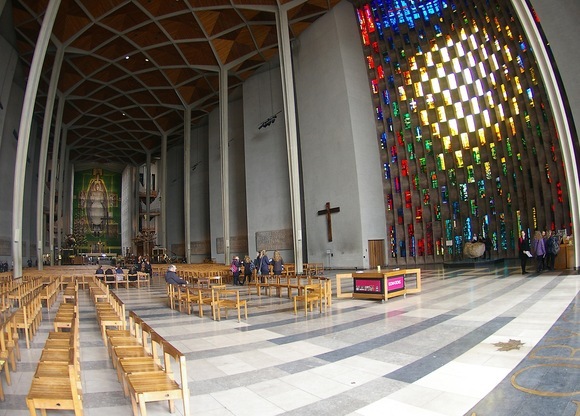 COVENTRY, United Kingdom – In need of a complete overhaul of its audio signal distribution, the historic Coventry Cathedral recently underwent a major upgrade, bringing it into the digital age with a HARMAN BSS Audio Soundweb London system. The famous Coventry Cathedral, which was destroyed during World War II and eventually rebuilt, has been a place of Christian worship for over 1,000 years. The installation was handled by AV provider RaceTech AV led by Robin Dibble, head of audio engineering and responsible for an upgrade to the church’s audio system 20 years ago. All BSS Audio equipment was supplied by UK HARMAN distributor Sound Technology, Ltd.
More than two decades later, the same solution is easily attainable with modern digital electronics from BSS Audio. “This provides greater reliability, lower energy consumption and lower running costs,” added Dibble. Dibble deployed a BSS Audio Soundweb London BLU-160, configured with 16 mic/line inputs. By expanding the I/O capacity with an 8-input BLU-BIB and two 8-output BLU-BOB breakout boxes, Dibble was able to increase the routing capability to 24-in/16-out, using BSS Audio’s BLU link digital audio bus between devices. “As for BLU link, this provides big system cost savings as there are no network switches, no extra cards and it’s self redundant. The result is a better sound quality, and I have only had positive comments, as no one believed such a sound as this would be possible,” added Dibble. The base for this system is installed in a console near the rear of the cathedral, for use by the clergy. In addition, the equipment rack, which houses the amps, DSP and radio receivers, is in a dedicated room immediately in the back. Within the church, the reaction to the upgrade has been overwhelmingly positive as well, “The audio installation provided by RaceTech has greatly improved the audio quality of our corporate worship and the diverse range of events the Cathedral hosts. The sound is clear and evenly distributed, and the system is coping well, utilized in isolated areas for small gatherings through to full congregations of 1200 people,” said Jenny Thurston, Head Verger for Coventry Cathedral.